To aid in the reading of this story, A popup has been added for each writer/speaker. Simply move the mouse over some the text. If you find this annoying, move the mouse to one side. There is a new ruler in the Kingdom of Wacky, and the Seal of Authority is safely secure near the Seat of Ease in the big red house on the hill. Celebrations have erupted throughout the land, and the pleasant paddlers have been observed drinking Champaign from their very best plungers. There is a giddiness in Malden that fills the air like the scent of freshly grilled meat. WE … are the Wacky! How did all this come about, you ask. We are a simple people; we kayak, we drink beer, and we wonder. We wonder how it would feel to enter the exalted state of bliss experienced only by the most wacky of the wacky. In the post-paddle twilight hours, when we let our guard down, we openly acknowledge that this must be our quest. After a long and wearying campaign, today would be the day when we would achieve Nirvana, or see our dreams dashed on the rocky coast of the Greene County shoreline. Today is Sunday, July 16, 2006 - the day of the Wacky Raft Race. And this is what happened. Paul awoke in pitch darkness and thought unprintable thoughts. Shortly thereafter, Greg wandered in wearing his standard issue Viking gear, and called 911 because Bullwinkle was among the missing. Assured by the Bull Moose that the wandering Wally Winklepoopf was on his way, the trio set off with a Stevedore to deliver our raft to Athens. It was a warm, gray pre-dawn. The alarm went off and, I looked at the time, groaned, and rolled over so I might be briefly reacquainted with Mr. Sandman. In due course I stirred and decided that it would be just as well to get up and be done with it. Lots to do today. After letting the dogs out, I thought that ham and eggs sounded fine. There weren't any in the house so my stomach growled a bit as an old bagel said good morning to it. After eating and checking my list of things to not forget, I left the house thinking that I was definitely forgetting something, and headed to the big red house on the hill. It was a foggy morning and reminded me of the Viking movies I had seen, as a kid, when the boats always put out into the fiord's in the cold, gray, foggy pre-dawn on the way to sack and pillage some unsuspecting village somewhere. Upon my arrival at Paul's I found Paul and Steve talking about the day to come, and making preparations for getting under way. I had a cup of coffee and transferred my gear into Paul's truck. It was now about 6:15 and there was no sight of Don Bullwinkle who was supposed to meet us here at 6:00. After checking our watches, we decided that Don's watch was set to Wood Standard Time. We decided it would be a good thing to go soon, so a call to Don was in order. After consulting the phone book, ( there are a lot of Bullwinkles in the book ), the correct number was found. I called out the number to Claudia, who by this time was standing expectantly by the phone. She raised the hand piece and the call was made. " Hey, where are you? They are ready to leave". A sleepy voice on the other end told us that Don had just left and should be there soon. Oops. I hope Don's dad got back to sleep. Anyway, as soon as Claudia hung up the phone ,Don drove in and we were good to go. Out through Malden, and up 9W, the fog was thick. The sun was trying to break through but was being fought back. It was only a matter of time before it got hot. Don and I rode with Steve, with Paul following in his truck with the Crapper - pult on board. I couldn't help noticing Steve looking nervously at his rear view mirror at the raft. No doubt he was troubled by the heavy burden of towing a craft that was so obviously destined for great things. As we arrived at the first stoplight in Cementon, Steve stopped and got out to walk back to Paul, who had been flashing his lights and signaling to us. Upon returning to the truck Steve was shaking his head slightly. When I asked him what was wrong, he just said that Paul wanted to tell him everything was alright. We continued our journey without incident and arrived at the Athens boat launch around 7:00. There was no one there save for a man, bare-chested, unloading what looked like boards from the back of an old pick up truck. Little did we know at the time, that we were witnessing the birth of the fastest raft of the day. We offloaded the raft and set about doing the final assembly, each one of us singing silently to ourselves the wack-a-doodle song. Ed showed up shortly there after and the rest is history. We came, they would see …. Hooo-Rahhh! Yesterday, a day that will live long in the annals of the Malden Yacht Club as our day of ultimate glory, has come and gone. This is a day that should not be forgotten! I intend to add my recollections, rapidly fading from too much exposure to the sun (and possibly too much exposure to the club‘s drink of choice), to the recorded history of our great endeavor. It would be a shame if that was the sole source of information. Our victory, the result of a true team effort, should be documented in the same manner. Each of you must have some recollection of the events of the day, great or small, that when woven together will create a tapestry glorifying our magnificence. Who wasn’t stirred by the grace and power of the mother ship slicing through the waters, its mast standing tall; or delighted by the sight of the crapper-raft leaping over the waves like a flying fish, while Kevin launched body parts in machine gun style; or exasperated by OZ’s repeated threats to disqualify us before we had ever set plastic to water? Send me your memories, your thoughts (that you can spare) and your delusions, and I will conclude this treatise, which will be read by the children of Malden for centuries. Gregor the Strong Stone has already sent me two pages detailing his craving for ham and eggs and fear of the fog. Shirley, I mean surely, you can do better than that. This is your chance to be a hysterical historian and to silence forever these nagging e-mails. Send it to me now, for I won’t relent (I might, however, forget - which is another reason to send it out quickly). In the meantime, I extend my sincere thanks and congratulations to all of you who made our sick mental state recognizable to the public. It is amazing how much effort we expended to prove that we are slightly less than sane! The first response was from a founder who didn’t flounder in the raft race. From his position as watcher from afar and critic at large, “Benny” was effusive in his praise for our effort, but still somehow reluctant to return to the fold. We’ll have to try to change that. I tip my hat and hoist my bottle(s) to the members of the malden yacht club for their inspirational effort on the hudson river yesterday despite overwhelming heat and sun, official race day hysterics, and devious attempts by the competition (like running over MYC members with a trailer while in the river) to waylay our team. As a founding member (and self proclaimed visionary) the sight of the outhouse coming down the river at high noon brought a tear to my eye as I thought back to the early years when there were only a few, and when the sewage system (and the real outhouse) were at their worst. I was also very impressed by the alcohol abstinence efforts before the race. For the future I suggest that the less the race craft is in the water the faster you will be. I also suggest a thoughtful Latin inscription on the outhouse, and possibly dedicating a picnic table at the club site to the MYC, with a ceremony appropriate for the event attended! by high ranking local politicians (that we like - which will not be a big list). Finally, throw the pre-race abstinence from alcohol over the side. it don't matter a hoot. Having passed out all these kudos I will probably continue my absence policy. I arrived at the Athens boat launch about 7:30, and found Paul A., Greg and Bullwinkle already at work assembling the outrigger. I immediately started what proved to be an ineffective campaign to prevent sunburn by slathering myself with SPF 735 (or maybe it was STP 40). Anyway, I was as slippery as a greased pig, which may have contributed to my feeling that I could get away with just about anything today. Watch out Greene County - the Master and Commander was on the scene! Temporarily overcoming my ineptitude at manual labor, I joined right in fastening the pontoons to the outrigger frame, using vinyl ties. Done! What’s next? By this time, big Tom had arrived and he, Bullwinkle and I started attaching the pvc pipes to the crapper-raft using the same method. Unfortunately, Tom and Bullwinkle are unaware of their immense strength, and when the Flush returned from working the crowd (his groupies are ever-present), he was shocked to find a growing mound of broken vinyl ties. After muttering something about the inanity of leaving the incredible hulk in charge of building a doll house, he restored order, and assigned everyone to a task which suited his abilities. I was assigned to go talk to the group of ladies clad in the florescent green T-shirts that proclaimed their status as race officials. Still puffed up by my greased pig status, I sauntered over toward their table like a sultan heading for his harem. I was about 10 feet away when a very pleasant lady looked up at me and announced to all “You are just the man I’ve been waiting to meet.” My cloak of invincibility quadrupled in strength. I had finally met Marge. After a quick introduction, and an acknowledgement of our various roles in the pre-race communications, Marge and I quickly became like long lost friends. Apparently Marge wasn’t sure what to do with the first few e-mails she received, so she forwarded them to everyone involved in the race. Once she realized what we were doing, I think the circulation list expanded to half of Greene County. I had been asked several times earlier in the morning, by key lime ladies I encountered, if I knew anything about the e-mail messages Marge had received. Each time I denied having any knowledge of the source, but when Marge insisted that I go over and introduce myself to her husband, I proudly identified myself as the informant. A good laugh was had by all, and the chip on my shoulder was now as big as the raft. That might not have been a good thing. It is impossible for an event of this size to take place successfully without a large group of volunteers willing to give their time and energy without hesitation. Marge and her companions obviously fell into this category. On this day alone they arrived early, stayed late, and remained in good humor throughout. Who knows how much time they spent prior to Sunday to assure relative order in a disorderly environment. They deserve our respect and gratitude, and I know they have mine. But not everyone who volunteers to be an official has the same spirit of equanimity as these fine ladies. One official, who I will refer to as OZ, for "over zealous", apparantly had us pegged for a bunch of renegade kayakers. In his defense, he wasn't far off. One of the allures of the Malden Yacht Club is our willingness to temporarily suspend the application of the more nitpicking regulations that permeate modern life. In our real lives, we are educators, business people, engineers, building inspectors, lawyers, and law enforcement officers. We spend most of our working hours honoring, interpreting, and even enforcing the various laws and rules of society. But when we get together as the Malden Yacht Club, we revert to teenagers for a small window of time, and in a controlled setting, we ignore all rules save those essential for safety. I don't think OZ could ever join our club. It must have been OZ's duty, whether designated or chosen, to weed out the cheaters among the rafters. His usual greeting to each of us substituted a "you can't tow with your kayaks" for the expected "Good Morning, how are you?" Oh well, somebody has to man the purity patrol. We would just have to try to convince OZ that we really weren't outlaws,! even if deep down a small part of us thrilled at wearing that label. Soon the parking lot was infested with rafters of all descriptions, although we were definitely a class to ourselves. Our teams and support crews were all present, including Captain Mike, who was now resorting to chain smoking to stem the rising pressure. With work on the raft almost complete, it was time to don costumes and pose for pictures. I must say, we are a scary bunch of Vikings. Descriptions escape me. Fortunately, pictures numbering in the thousands have now made their way across the internet, so no description is necessary. I will say that with our tribe parading around the raft in full Viking regalia, while Kevin test fired the crapper-pult and the “Volga Boatmen” played in the background, we did put on an awesome show for the officials and our terrified competition. Once again, I could taste intimidation, and that might explain my second encounter with OZ. As the raft lay half in and half out of the water on the boat launch, Don Bullwinkle and I thought it might be in the way of other rafters trying to launch. With this in mind, we boarded and paddled into the creek. With the Crapper - Pult attached, and only two of us on board, I could only gulp and think we were in for some long, hot day on the water. Things looked up when Joanie swam in and hopped on board. She was a sight for sore eyes, and not sore eyes come to think of it. Paul got on the raft, Kevin climbed on the Crapper - Pult, and we were off. We got out into the river and to the starting line easily, only to find that the current was taking us too far south. While this could have been a good thing if we had planned to cheat more than last year, we decided to play fair, mostly. After struggling to keep from going south, we finally managed to get to the shore. (Ed’s note: I could see that the conjoined rafts were not designed for maneuverability or to reverse directions. The attempt to steer and paddle this behemoth upstream resembled a pinwheel spinning out of control, and would have been fun to watch if the effort weren’t taking so much energy from the racers. When the crew was able to reach somewhat shallow water, I exited my kayak, and neck deep in the river, walked the rafts over to the ! retaining wall lining the shore. Swimming back to my kayak, my Viking horns resting squarely on my head, I must have resembled a mutant musk rat, but no loss of dignity would be too great if it assisted our effort). While we rested at the wall, we amazed the crowd with flying body parts. Ed was being interviewed by the newspaper, and Joan was wondering where Chuck was with the power boat. Paul A. held us in place until the start of the race, and when the flares were seen, we jettisoned the Crapper - Pult and started our quest for immortality. The first few minutes could only be described as unbelievable. There were no other rafts in sight. We seemed to own the river. Had we looked over our shoulders we would have seen a few other rafts closing up. After that, the rest of the race is a blur. I remember Don yelling from behind, coaxing us on. and Joan up front doing the same, although without the leather whip. Theresa and Debbie kept station close to us, and regularly used their bilge pumps to cool us down. Theresa became so involved that she tried to cool down Moana, and wound up broadside in front of the raft, only to be pushed along for about twenty yards. We thought we were doing pretty well until the Crapper - Pult passed us! This was embarrassing, but the revenge of the outhouse was not to be denied. (Ed’s note again: I am surprised that a man of Greg’s experience would not realize that you cannot judge how a vehicle will handle until you test drive it. Having paddled the raft the day it was built, I knew that, despite it’s appearance as a sleek and speedy craft, it would require a tremendous effort to move it along for a sustained period of time. It had always been my intention to see if the light weight crapper-raft could keep up with, and possibly pass, the official racing raft). Kevin gave a combination wave and thumb Nose as they disappeared in the distance ahead of us. From time to time we thought there were vultures flying above the Crapper - Pult, but it was the severed body parts trying to get to heaven to join the rest of the body. They kept coming down so I'm not sure what direction they were meant to go. Perhaps heaven was not the final destination. We finally got close to the finish and a great cheer was heard. Not from the crowd on shore, although that roar was pretty good, but from us. Beer was near!! We finished the same place as our number, and all that remained was to await the final confirmation of our wackiness. (Writers note to Ed: Feel free to edit and re-arrange as you see fit. I have been outside in the heat and my judgment and writing ability have certainly been compromised. Ed’s note to writer: as a certified control freak and micro-manager, I always presume the authority to change submissions at my whim; very little alterations were done in the telling of your tale, although some names were changed to protect the miscreants. Now go soak your head in ice water ). As Greg and his team of racers sped the raft out of the starting gate, the crapper-raft and crapper-pult drifted in its wake. It was time for the Malden Yacht Club Tow Team to spring into action. Waiting to hitch to the raft and start towing, was a hand picked group of three Seals and a Guppy specially chosen for this task. The Seals (the Flush, Don Juan, and yours truly) were massively fit paddlers with enormous experience that made them well suited for this task. The Guppy was Wet-Line Leo, whose inclusion on the team was mandated by the nautical provisions of the Kayakers With Disabilities Act. Wet-Line had at one time been an active paddler with our group, but had gone into hiding over the last two years. The exact reason for his disappearance has never been determined, but I think it was to avoid exposure to the caustic wits that proliferate among our group. He probably felt that if he flew under the radar, he would be able to escape from the barbs that fly through the air during our gatherings. Bad Move, Mr. Sunshine. We just save them up for the next available occasion - like now! With the crapper-raft hooked to our lines, and the crapperator eager for action, we took off in chase of the pack of rafts sailing down the river. It was like the fox chasing the hounds. Our wisdom in choice of vessels became evident as we slowly picked off raft after raft. We would have been even quicker if Leo’s tow line didn’t drag on the river bottom so often that we had to stop twice to release a sturgeon. Far ahead was Tom, in our scout kayak, stealthily shadowing the leaders, and poised to run interference if we were able to overtake them. We paddled like Vikings possessed as we tried to narrow the gap. When we eventually passed our main raft, I urged Kevin to salute with the dark side of the moon, but he refused, and merely thumbed his nose. As he enters his teenage years, he may regret the opportunity lost. That would be the only opportunity that Kevin lost this day. As the outhouse was propelled down the river like an oversized water skier, Kevin permanently entered lock and load mode. The crapper-pult swung into action and body parts filled the air. In addition to launching, Kevin also tried to retrieve the falling missiles by leaning far forward on his narrow platform, and gave every appearance of a hydroplaning Houdini. These acts of reckless abandon were totally unnecessary. Our support-retrieval team of Roy, Bonnie and Pat (this could be the first time I have ever split up Pat-Roy) did such a super rescue job that all hands (and feet), but one, made the entire trip. As soon as a body part touched the water, their kayaks swept in and they snatched the limb like an osprey clutching a carp. We were a well-oiled machine. We would have reached Catskill even faster than we did if two of the towers weren’t State employees and a third, a union man. The water breaks were interminable. Those of us who are self-employed measure our breaks in nano-seconds. Oh well, longer breaks did have its advantages. Kevin’s continuous firing of the crapper-pult drew attention to our craft, and dressed in his Viking outfit, he turned out to be the ultimate babe magnet. Scores of motorboats filled with bikini clad twenty-somethings pulled along side to watch Kevin in action, and the young ladies thought that he was just cuter than a cocker spaniel. Since most of them were on my side, I tried to vicariously bask in Kevin’s glory, as I felt the cockiness I experienced earlier in the morning return with a vengeance. Even Leo, his line no longer limp, turned his attention to that side while we were paddling, and if I hadn’t been vigilant, the crapper-raft would have been pulled ap! art like an overdone wish bone (Don Juan and the Flush never deviated from their task, and continued to plow forward). Finally, we reached Catskill. We considered re-attaching to the main raft, but realized that its lack of maneuverability would result in unavoidable disaster. By now, Kevin was launching so rapidly, that I feared the raft would spontaneously combust, and burn to the waterline. It was time to exit the river, and wait for the results. We had done all we could. I was in Texas at the Austin Zoo and I was looking at the monkeys. My grandparents’ phone rang and it was Tall Paul. He asked to speak to me. He asked me if I wanted to be a craperator on the Malden Yacht Club crapper-pult. I said, “Sure, that would be fun”! When the big day finally came, I was very excited. I dressed up as a Viking raider in a Viking costume in some animal fur and a helmet with horns. On the front we had a victim and her name was ‘Moannie” We put the raft in the water and we raced for the start line. The craperator float had a catapult on top of an outhouse. There were make-believe body parts that I had to catapult into the air to amuse the crowd. I was pulled by Ed, Paul A., Don Juan and Leo. I liked it a lot but it was hot but the water felt really good. When we got to the finish line the judges had to look over our float and we got the award for the wackiest raft. The best part was catapulting the body parts into the water. I had a really good time. I was in Texas at the Austin Zoo. We were walking by the monkeys and all of the sudden my grandparents’ cell phone rang. It was Paul A. He wanted to speak to my brother. Paul talked to my brother and said my brother could be a craperator on a crapper-pult. And, it’s no fair. So I got so mad because I couldn’t ride the crapper-pult. I didn’t know what one was but it sounded like fun. So I’m kayaking on Tuesday because I want to ride a craperator. I can’t wait to be 10. The end. A thunderous cheer was heard from the shore as we crossed the finish line. Was the crowd truly happy for us, or cheering at the prospect of seeing the last of the Crapper - Pult? Some sensibilities were offended by the sight of body parts flying through the air no doubt, but that was part of our plan and goal. As we heard our name over the loudspeaker at the finish line, I simultaneously heard Splash behind me say he was diving off the raft, and going for a swim. It was not to be. The officials at the finish line beckoned us forward and guided us toward the boat ramp in readiness for the take out. There was much commotion on shore with people looking, laughing, and wondering who we were and from what hiccup of a day dream we came from. Moana was sideways and slipping from the bow looking like she had just gone twelve rounds with George Foreman … no decision. I can't speak for Joanie, Paul or Don, but I don't mind saying that I was sore from the journey. The MYC support crew was there waiting to haul us on shore, and we came to rest on the side of the parking lot just above the boat ramp. The next hurdle was how to get the raft onto the trailer and out of the way. Our members had been scattered, and were working the crowd. Occasionally you caught a glimpse of horns bobbing up and down in the distance, surrounded by a halo of invincibility. After much thought and many questions, like who's got the beer, the trailer was located and pushed by hand to the raft. The raft was loaded and the beer swilling began. I had been checking out the food when I heard the announcement that the awards would begin in about ten minutes. I wandered back to the trailer to convey the information and found Ed, Mike, Tom, Theresa, Don, Joel, another Don, Pat, Roy, Bonnie, Paul and Paul sitting in the shade having snacks and drinking beer. I evidently got there just in time because I snagged what looked like the last beer. In due course we assembled within earshot of the awards dais, and awaited our ultimate victory. Not 1st or 2nd, nor even 3rd were we to be. We were awarded the title of most Wacky. We marched up to accept our award. It felt like we were getting the Medal of Honor, Blue Max, Pour Le Merit and were being Canonized at the same time. Ed gave a few, uncharacteristically short, acceptance words, and we retired from the stage to drink champagne from horns and plungers in true Malden Viking fashion. I think that about covers the trip from A to C.
We came … they saw … we conquered. 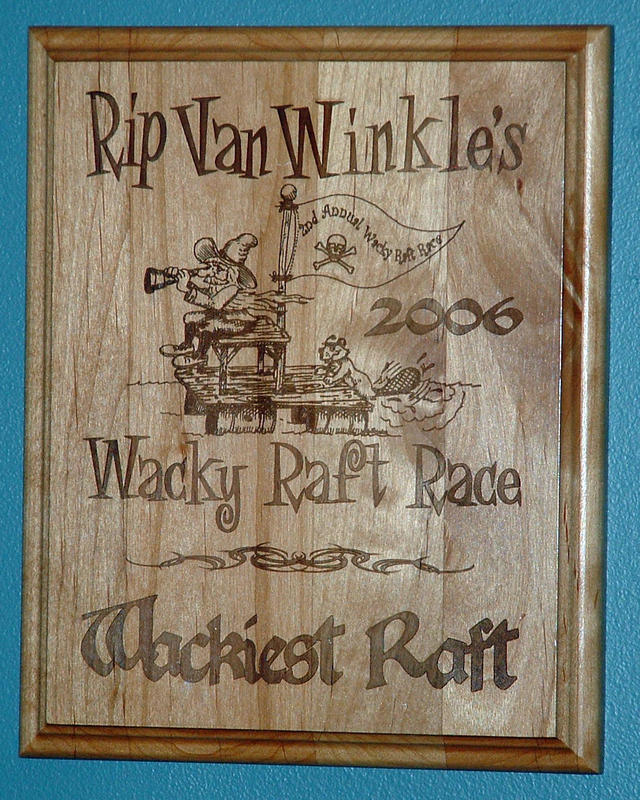 The plaque given to the Wackiest Raft.